Step beyond the current limits of physics? All clear ahead! Effektor Biking power Bib Tight Explosive sprints and quick surges are the trump card of successful bike racers. 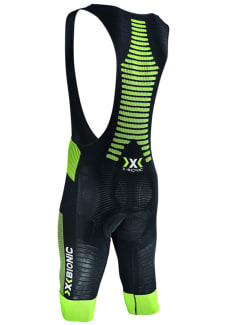 With the Effektor Biking Power Bib Tight you too will have it in you to pull away from the field. 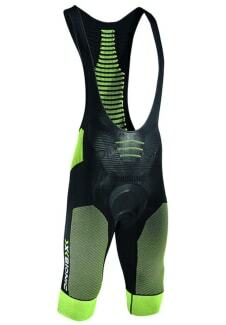 The Effektor Biking Power Bib Tight blends ideal fit and effective body cooling for higher performance. But its superior construction goes much further: The Effektor concept creates additional performance potential with its unrivaled X-BIONIC Partial Kompression. It also transfers targeted impulses to the large muscle surfaces and activates the Neural-Response effect. That acts to preload neuron receptors and prepares the muscle so it’s ready to spring into action quickly when it is activated by impulses from the brain. Muscle contractions, and subsequent power transmission to the pedal, are quicker, more coordinated and more precise than ever. Gain an early technological advantage at the starting line with the Effektor Biking Power Bib Tight.